Meb Keflezighi was the first US male to win the Boston Marathon in 31 years. He was the oldest champion in 83 years. But his victory Monday afternoon, perhaps the most emotional and daring in the history of the world’s most fabled road race, was about more than him. Keflezighi didn’t run last time but he watched from the grandstand and was inside the Fairmont Copley Plaza when he heard the explosions that left three spectators dead and wounded hundreds of others. “I threw an F-bomb and started crying,” he recalled. And then Keflezighi vowed to return for a day when the city could show its resolve and resilience to the world. “It was my dream to win just like the Red Sox did, and try to do the same thing for the people,” said Keflezighi, after the Eritrean emigre become the first American to win here since Greg Meyer in 1983 and the oldest since Medford resident Smiling Jimmy Henigan in 1931. Keflezighi had been the rainmaker elsewhere, ending American droughts that had lasted for decades. His silver at the 2004 Olympics in Athens was the first medal since Frank Shorter’s silver in 1976 in Montreal. His New York triumph in 2009 was the first there since Alberto Salazar’s in 1982. Boston was the one that was missing from his résumé. So he went out and grabbed it, taking off smartly with countrymen Ryan Hall, Abdi Abdirahman, and Josphat Boit and staying up front when the pack receded. 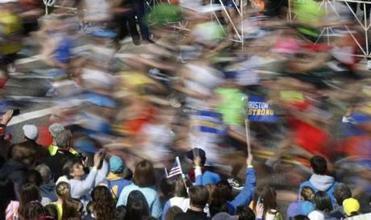 By the time they got to Natick, Keflezighi and Boit, a late entrant, were all by themselves. It wasn’t as if they were kicking up their heels — their 10-mile split (49:08) was only 13 seconds faster than last year’s when Lelisa Desisa won in 2:10:22. But nobody was coming after them. None of the contenders — not Chicago course record-holder Dennis Kimetto, not former New York victor Gebre Gebremariam, not Desisa, not Hall, who set the US record here three years ago — wanted to give chase and burn fuel that he might need later. “I was a bit scared of the hills,” said Chebet, the three-time Amsterdam winner. Keflezighi is going to be 39 in a couple of weeks. Boit is a half-marathoner whose 26-mile best was 2:13:14. They didn’t figure to hold up, yet by the halfway point they had a 30-second gap on the field. Then Keflezighi, who doesn’t mind a bit of springtime solitude, decided to shake Boit. The place to do it, he reckoned, was the steep downhill out of Wellesley heading into Hell’s Alley, the flat stretch just before the Route 128 overpass. The final couple of miles, though, were rough. Keflezighi was laboring and grimacing going through Coolidge Corner and he knew that someone would be closing on him. He turned and saw a Kenyan in an orange singlet closing in, slicing the gap from 40 seconds to 12. Coming into Kenmore Square it seemed that Chebet would overhaul him, but Keflezighi still had a bit of gas in his tank and Chebet was flagging. With a mile to go, Keflezighi began sensing that it was his day, but he still checked his rear-view mirror. “Looking back is not a bad thing,” he said. “It can save you a win.” By then, all of the rest of the contenders except Chebet and fellow countryman Frankline Chepkwony were out of commission. Desisa, Gebremariam, and Kimetto had dropped out and Hall ended up 20th in 2:17:50. Once he turned onto Boylston Street for the final stretch, which had been a place of blood and smoke and shock a year ago, and saw the finish line ahead, Keflezighi knew that the circle had been closed for a suffering city that finally could celebrate. Keflezighi emigrated here with his family, five brothers and five sisters, in 1987 after living in Italy for two years. He began running at age 12 and graduated from UCLA with a degree in communications. He won four NCAA championships. Keflezighi’s autobiography, “Run to Overcome,’’ was prescient, given his performance Monday.